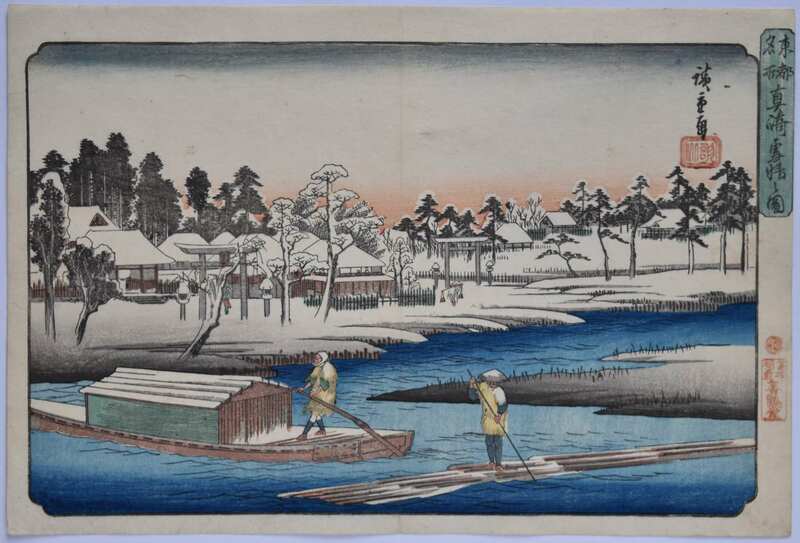 Masaki yukibare no zu, “Clear Weather After Snow at Masaki” from a Toto Meisho, “Famous Sights of the Eastern Capital” set published by Kikakudo (Sanoki), the seal in red in right margin c 1832-35. There is confusion over how many prints belong to this series: The original set of twenty-one prints seems to have been extended to fifty-five in c 1839-42. The temple, under a deep layer of snow, is shown on the far shore. 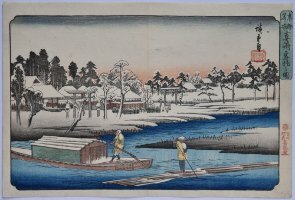 In the foreground two figures in yellow straw coats navigate the river. Very fine impression. Fine colour. Later editions have the black seal of Sanoki in right margin. Very slight centre fold and two backed pinholes; trimmed just on the black title slip on right, otherwise fine condition. Signed Hiroshige ga.